Happy New Year, people! I hope we all have an amazing year ahead in which happy memories are made, goals are accomplished, dreams come true, and life is mostly pleasant and hassle-free. In 2015, I was lucky to find my HG foundations - full coverage, matte finish, great staying power. Both drugstore and higher end. About five of them are HG, each serving a different purpose, as you will see. 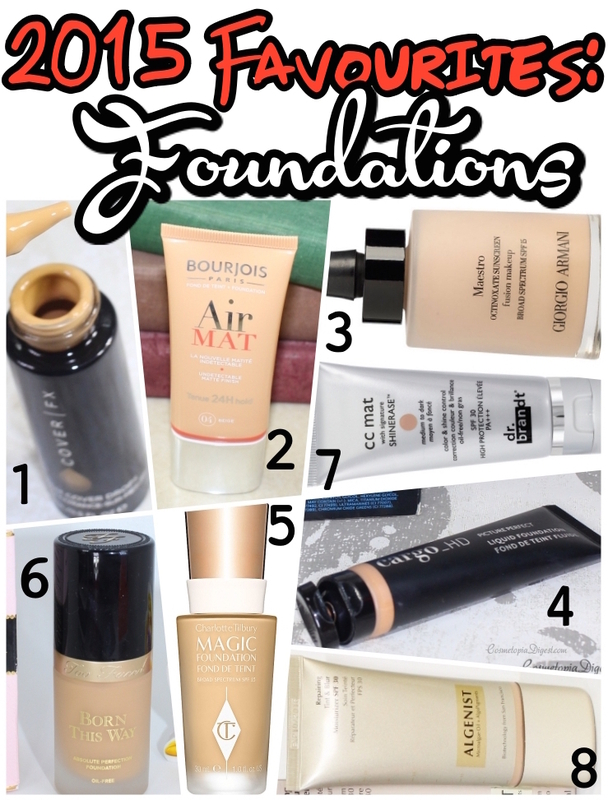 Scroll down for more on my favourite foundations of 2015 and why I love them. THE makeup product of 2015. Reviewed here. An amazing innovation that allows you to control coverage, finish, texture and colour of your foundation. Covers cystic acne beautifully. Need I say more? Best drugstore foundation of 2015. Lightweight texture but full coverage. Mattifies and lasts through the work day, though I have not tested it out for the 24 hour-stay it claims. For $15, it does a job that puts several high-end foundations on my shelf to shame. There are oil-based foundations out there, and then there are silicone-based foundations out there. About 99 per cent foundations fall into either of those categories, particularly in the latter one. However, this is one of the rare water-based foundations out there. Which is what people with acne-prone skin, large pores and problem skin must reach for. I am so behind things that I have not managed to review this - coming soon. I first had my doubts about the tube packaging and presumed this would be too thick and cakey. Wrong! This was a hidden gem, a lifesaver during flaky-and-oily days. A better version of Estee Lauder's Double Wear Stay-in-Place, which broke me out (the Light version, which I love, did not). I loved CT's Light Wonder Foundation, which has medium coverage, so I was looking forward to trying this out. This is a less runny, slightly-more-coverage version of Nars All Day Luminous Weightless Foundation. Lightweight, medium- to full-coverage and smooth, this foundation contains coconut water and is brilliant for dry skin. I love that there is a great shade range for yellow people such as myself. My only gripe is, it does not stay as matte on my super-oily skin for as long as the other foundations, even above primer and below setting powder. I was anti-BB/CC creams when 2015 began, presuming the coverage would be too light and insufficient on my blemished skin. This is one big exception. Not only does it cover everything on my normal-day skin - not when I have cystic acne - but it also has a beautiful matte finish. Comes in two shades, both of which will adapt to your skintone. I picked this up in Sephora Italy after I tanned - burned - to the point of soreness (Thanks, Colosseum). The SA assured me this would help calm my face while also evening out the skintone and she was right. Has less coverage than Dr Brandt, but is ideal for days when you want to look barefaced, or nip out to the corner store. What was your favourite foundation in 2015? Tell me in the Disqus comments widget below.